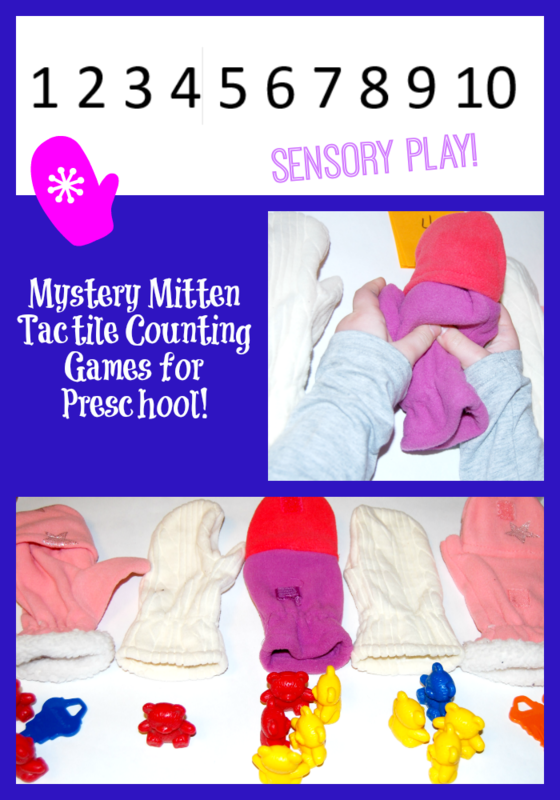 Mystery Mitten Tactile Counting Game for Preschool! If you are new to the Wednesday articles from the #TeachECE Team, we wish you a warm WELCOME! Every week, we partner with some amazing blogs to bring YOU new ideas for playful learning at home or for use in the classroom. This week’s activities are centered around a MITTEN THEME for preschool. Gather some real mittens and come play a tactile mystery mitten counting game to encourage early math intuition with tactile support! Decide what numbers your children will focus on. If the children do not have a good understanding of the numbers 1-5, work with those numbers until the kids have confidence with one-to-one correspondence and subitizing skills before moving on to the numbers 6-10. Set out 5 mittens and randomly place counters in each mitten that correspond to the numbers 1-5 (or 6-10) – see photo above. Set each of the filled mittens randomly on a tray. Ask the kids to feel each mitten and try to figure out the number of items in each of the mittens by TOUCH ALONE. Once the kids think they have a guess at how many counters are inside the mitten, they should sort through the numbered cards and place that numbered card on top of the individual mittens. 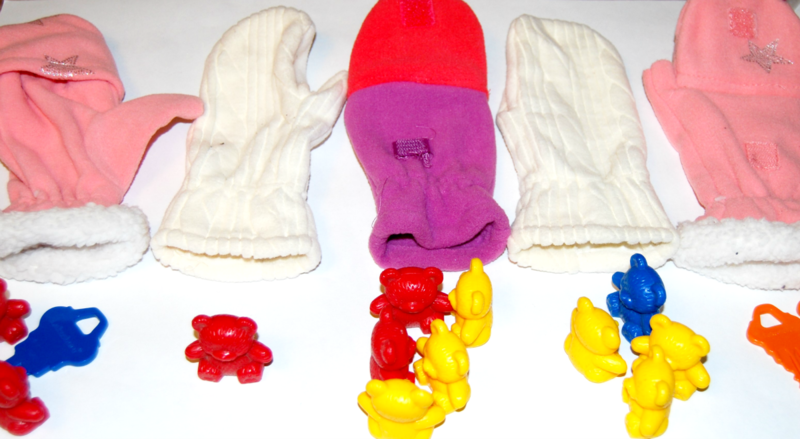 Have the kids take out the counters in each mitten (one at a time) and count the number to see if they were right! For very young children, attach a copy of the numbered cards to the backside of the mitten (or sticky notes work well, too). 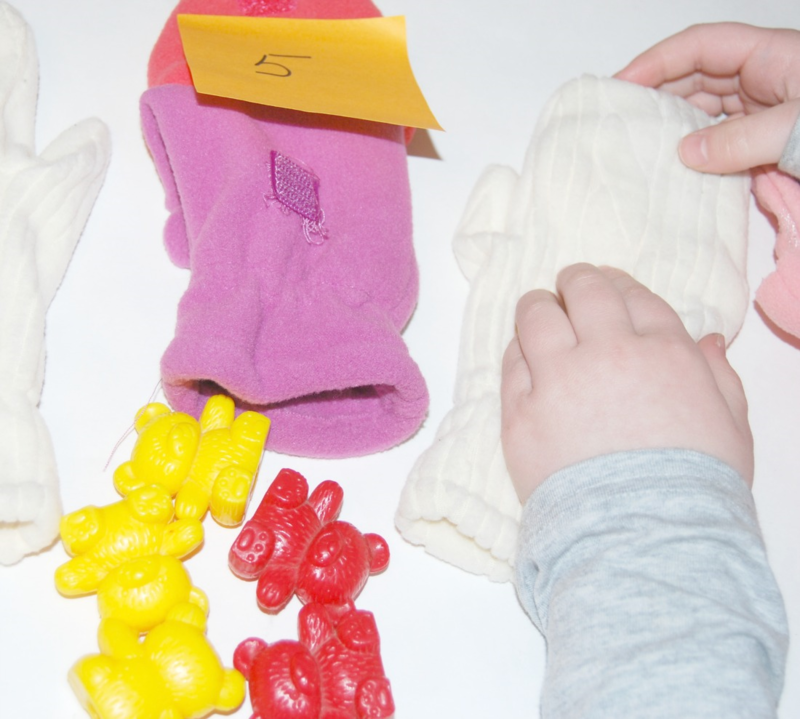 As the children count the items, they can turn the mitten over to see if they got it right. Have the kids sort the mittens in correct number order 1-5 or 6-10 after feeling the number of items inside the mittens. Lay the corresponding numbered card below the mittens and then count the items inside the mittens to see if they are correct. Fill a pair of mittens with matching numbers of items. Make another pair of mittens with a different number of counters inside. Randomly place the mittens out of on a large tray or table. See if the kids can find the matching pairs of mittens by touch alone. As the kids gain confidence, add more pairs of mittens to the center or activity tray. Fill mittens with counters that correspond to the numbers 2-7. Invite the kids to count and sort the mittens into a number line starting with a number other than 1. Again, the kids should count with touch alone, add the number cards (printed above), and then count the items inside to see if they were correct. For MORE ways to play and learn with a MITTEN THEME, please visit the wonderful resources below! « Arctic Animals Preschool Science: Blubber and Ice Explorations! My kids love guessing games so this will be great for us. What a great activity – we’re going to give it a try this weekend and add together the right and left hand to extend the activity for my eldest as well. Oh, what a fun mystery game this is. I am trying this one today. Substituting the mittens with caps. Our move took us out the cold and we seem to have lost our mittens, lol. It would be really fun for kids to determine how many things were in each mitten by touch alone. Love it! Pinning. surprises and counting! love it! SEARCH for an ACTIVITY or SEASONAL THEME HERE!